It takes an unnatural (oftentimes supernatural) occurrence to send mankind teetering into a state of mass paranoia, and films about such situations often follow the same paths as their characters. At first, there is much running around, little explaining, and even less reasoning. During these tumultuous times, the characters are scared and frenzied, and often make irrational decisions, and the film, much the same, is all over the place, focusing on too much at one time while being swept up in all the commotion. But then, as the characters calm themselves down and begin to make sense, the film finds its focus and hones in on a common thread that ties all the events and all the characters together under one theme. Here is such a film. 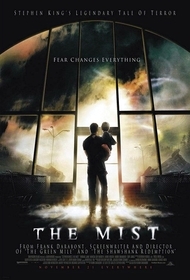 In Frank Darabont’s The Mist, based on the Stephen King novella of the same name, an electrical storm sends the residents of a harbor side town in Maine to the local supermarket in search of supplies. There, dozens soon find themselves trapped as a thick mist rolls in from the mountains, blanketing the town in haze. Among the trapped are: David Drayton (Thomas Jane, The Punisher), a movie poster artist, his son, Billy (Nathan Gamble, the upcoming The Dark Knight), Brent Norton (Andre Braugher, “Homicide: Life on the Streets”), the neighbor next door, Ollie Weeks (Toby Jones, Infamous), the store clerk, and Mrs. Carmody (Marcia Gay Harden, Pollack), a religious zealot and demented extremist. From the mist emerges a bloodied and hysteric Dan (Jeffery DeMunn, Hollywoodland) who proclaims: “There’s something in the mist!” “Something” turns out to be giant mutated creatures. If the above description sounds like the plot outline to an old-time black-and-white monster movie, know that The Mist looks and feels like a throwback to those same films, despite the fact that it is presented in full color. This is truly a shame, as the first-half of the film – filled to the brim with a cast of overly eccentric characters as well as less than stellar special effects — would have worked better in Darabont’s original conception of doing the movie in black and white1. Thankfully the second half, which works in either conception, shows some emergence of theme and the characters, though still hogging the screen with their eccentricities, feel much more comfortable. 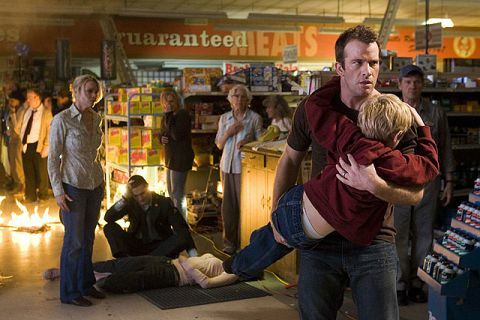 A supermarket under siege in Frank Darabont's The Mist (2007). The trouble with these characters is in their slighted development, attributable to Darabont’s screenplay, which rushes to the supermarket locale too soon without the proper introduction. Take, for instance, a scene where David attempts to show Brent the remnants of a mutated tentacle taken from a recent attack in the loading dock of the supermarket. Almost instantly, Brent accuses David of making him look bad and feeding him lies, which takes the audience by surprise considering up until this point, the two had been charitable to one another. Since the audience knows little about Brent, he seems demented during this exchange, which makes little sense when compared to a later scene where Brent manages to convince a collection of survivors to leave the supermarket and brave the mist. Even underdeveloped, the cast of characters within The Mist are generally discomforting because their personalities are so over-the-top and eccentric that the viewer must question if such people exist in a world outside Maine. There’s Mrs. Carmody, who upon first sight of the mist declares, “It’s death out there” and suggests human sacrifices in order to please what she believes to be a vengeful God. It’s obvious that we’re not supposed to like this character, but the length at which the script goes to to achieve this is unreasonable, especially after a fellow survivor offers her friendship and Mrs. Carmody suggests that she’ll squat on the floor to produce a better friend. But that’s all in the first half. In the second hour of the film, the factions of the supermarket are more defined, producing much more conclusive conflict and exerting a notion that humankind will go to great lengths if necessary for survival, a common theme in most of Stephen King’s works. Just watch what happens when Mrs. Carmody leads a sermon that ends with a command to sacrifice David’s son, Billie. Watch how David and his band of survivors attempt to protect the boy, and watch in particular, how Ollie decides to deal with the threat. It is a commanding scene that captures both the conflict and the theme of the film. As fewer and fewer survivors remain, the characters begin to feel less overbearing and exaggerated and begin to exhibit logical choices in view of their situation. The end of the film will likely generate much debate, as it provides the characters with a scenario that requires a decisive action, and that action is made in haste and seemingly without much thought. But look again. There is logic to their decision and although it is not the popular choice, it does demonstrate how far these characters truly have come in the span of the film’s 126-minute runtime. The two-disc special edition DVD of The Mist also contains the entire film in black-and-white, which has been unofficially deemed the “director’s cut” of the film. Darabont himself opens with a message about this original cut, explaining that this was his first vision of the film and the version that he truly wanted to make but ultimately didn’t as modern audiences did not react well to the lack of color. However, Darabont justifies his choice: “Black and white takes you to a place you wouldn’t see in reality.” Given the choice, watch the black-and-white version of the film for just this reason. The situations, characters, and dialogue in the first half of the film ring true to Darabont’s words about “a place you wouldn’t see in reality,” and while the overabundance of special effects present in the second half do not lend as well to the black-and-white version, there is a certain air about the movie that rings true to horror flicks of the 1960s. Certainly The Mist doesn’t rank near Darabont’s other masterpieces, The Green Mile and The Shawshank Redemption — ironically both Stephen King adaptations — due to its shaky start and its cast of hit-and-miss characters. However, despite a rough beginning, The Mist does end strong, providing the audience with an interesting morality tale that, much like King’s other works, evokes questions about humankind and their reactions to unnatural situations. The film also works in homage to black-and-white horror films, providing giant mutated creatures, over-the-top heroics, and bounties of bloodshed that are just par for the course. Credit: Frank Darabont’s commentary on the two-disc special edition DVD of The Mist. Submitted by Anonymous (not verified) on Mon, 2011-10-17 18:56.